Q1 Tell us your experience of first setting foot in the working world. I once received three job offers at a time and it was an unforgettable experience. After my istikhara (requesting Allah for guidance) and asking my family’s opinions, I was able to strengthen my resolve in accepting the job offer at the Kedah State Zakat Board upon considering certain factors. Prior to graduation, I was accepted as a coach or motivational trainer at a training consulting firm, Smart Triple IQ Sdn. Bhd, in Alor Setar. The experience there for almost a year taught me both the meaning and value of life that I eventually carried on to my next profession. After that, I received an offer as an Executive of Islamic Affairs at Adya Hotel Langkawi, a 4-star Islamic hotel developed by the Kedah State Government. At 9 months of having served there, I was promoted as Assistant Manager for Islamic Affairs and was responsible for managing a new Department, known as the Department of Islamic Affairs, Adya Hotel Langkawi. I served there for around 1 year and 5 months. My career path did not end there as I then received an offer letter to serve as an Officer of Islamic Affairs at the Department of Islamic Development Malaysia (JAKIM). However, before I had even reported myself there, I received yet another offer from the Kedah State Zakat Board to serve as an Executive Manager there. At the same time, I also received an offer letter to serve as a Sharia Officer at the Kedah Sharia Court. Q2 How does self-acceptance work in the career fields that you embraced? Honestly, when I received an offer at the Kedah State Zakat Board, I did not even imagine myself as the Head of Department. Yet, after reporting myself, I was immediately appointed as the Head of the Administration and Human Resources Department and was entrusted to take on this great responsibility. All praise be to Allah for this blessed endowment even at a young age with still plenty of experience to gain. I humbly accept this responsibility and trust given to me and will strive my best to develop the institution of zakat in the State of Kedah. I always pray to God to not make this sustenance as an istidraj (good fortunes to the disobedient) for me. My father’s message that “the higher the privilege gained, the higher the responsibility to bear” will always be held firmly in my life. Q3 Are there challenges in leading the work force? There is always a challenge with each career I have ever had. For example, the challenge I’m currently facing in my career is that most of my employees are those who are more senior in age and experienced than me, which calls for certain skills in dealing with matters involving Human Resources. But what is certain, we should confront challenges with a calm spirit and mind as God has promised to never defer responsibility to someone unless God knows that the person is capable of bearing that responsibility. Believe that behind every rainstorm, there lies a beautiful rainbow; so is it that despite every challenge, there will be a wonderful blessing or lesson that God wants to bestow upon those who face that challenge patiently. Q4 In your opinion, is it important for students to participate in outdoor activities during their studies? Honestly, when I was in charge of the Administration and Human Resource Department, I was involved with the interview process and most of the applicants were from among graduates who have just graduated from university. Based on my experience, the involvement of graduates in co-curricular activities is crucial to provide additional value and soft skills to a student. If a graduate wants to be judged exclusively on academic excellence, then he will not be able to accentuate himself from other present candidates who are no less academically gifted. However, it should be noted that the involvement and excellence in co-curriculum alone without considering academics is also incorrect as academics should still remain the priority of a student. What is important is that students need to be able to balance between academics and co-curriculum involvement. Q5 How do you perceive the development of USIM nowadays? 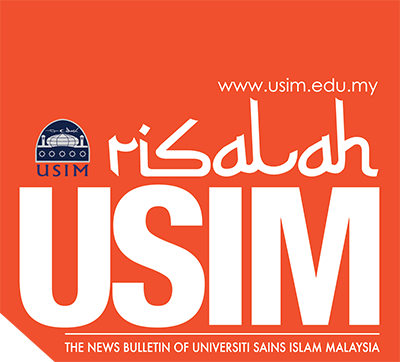 To me, USIM has now grown rapidly in different areas as compared to my previous days of studies. Now, USIM already has a great hall which is the Dewan Tuanku Canselor, as well as the Islamic Center or Kompleks Islam Tuanku Muhriz which can accommodate the needs and facilities of its students.